Radial spherical plain bearings – it’s a friction type bearings, which inner and outer rings have spherical form sliding, surface. Radial spherical plain bearings are designed to transfer radial, axial and combined loads in linkage of fast moving and fixed equipment, and in machine linkage. Radial spherical plain bearings are working by principal of one ring movement in regard to another ring. Friction speed is conditionally slow. surfaces are treated with a running-in lubricant. The inner rings are composed of hardened bearing steel and the outer rings of bronze. 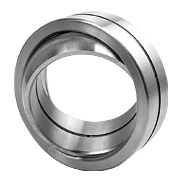 The inner rings are composed of hardened bearing steel with a hardchrome-plated sliding surface. The outer rings are composed of steel with PTFE-composite material which is pressed around the inner rings. Please note: These bearings must not be lubricated! You can search by the code fragment, manufacturer, or bearing dimensions, then you will be provided with all possible options. Enter code of the bearing, code fragment, or manufacturer.